It is with trepidation that I read books published under the rubric of the social sciences or humanities finding most of them poorly written, often self-serving, and filled with the jargon of the associated field of study (i.e. political science, sociology, et al). However, the significance of the subject and a brief skim read of a random internal page encouraged the review of A Half Century of Occupation. 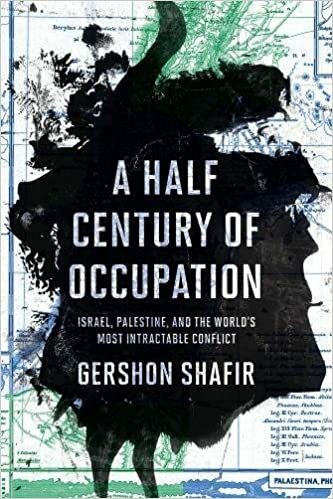 As it turned out, this is a well written and important study of the subject of its title, the occupation by Israel of the Palestinian “territories”, being the land occupied by Israel during the 1967 six day war. Given its social science heredity, it is clear of jargon, well outlined, well argued with clear presentation of hypotheses and short clear summaries of each section – in essence the best of what I have read from this field and capable of scrutiny under the genres of international law and history. The work discusses the occupation in relationship to many factors. Most importantly it deals with international law, human rights, military rule of the occupation, and the patterns and differences within the settlement patterns that started after the war. Starting with an examination of the various UN documents, the Geneva conventions, and customary international law, Shafir says. Israel’s claim that the West Bank, East Jerusalem, and Gaza are not occupied, consequently, ignores the clear trend of international law to affirm the rights of peoples and individuals with growing vigor. Under occupation, however, violence is more accurately described as occurring on a continuum that runs the gamut from coercive state action to suppression and war. The former almost invariably leads to resistance and thus is the precursor to and cause of the latter. The occupation therefore is best understood as ongoing, day-in and day-out coercion, and its injuries include material, psychological, social, and bodily harm. The coercive techniques of the institutions of occupation deployed to enforce submission produce the occasional eruptions of “military operations” and wars. Violence is omnipresent and found in all facets of the occupation; consequently, the most intense and bloody suppression of uprisings and wars cannot be considered in isolation from the occupation regime as an everyday occurrence. I quote this at length due its overwhelming clarity and its accurate summation of the actions and effects of military occupation. The third trend prolonging the occupation according to Shafir, accurately so, is the “special relationship” with the U.S., and the “security” demands of the state. Included within this topic is the idea of a “temporary occupation” which has its impact on Israeli military laws, the application of the Geneva Conventions and humanitarian laws, and the “temporariness” of the deeds provided to the settlement populations. Shafir argues that these frameworks are rooted in European origins (i.e. the nature of various intra-European ‘peace’ agreements that were constantly broken and reconfigured – temporary – without any consent of the local populations) and in the League of Nations mandatory law which allowed for ‘temporary’ actions that extended the European colonial system (Shafir does not present chronological arguments, but thematic ones that skip around in time). Possible solutions to the occupation and its violence are presented in the third essay. The use of statistical evidence on population, land areas, and costs leads Shafir to believe that a two state solution is technically possible. However he provides contra indicators, essentially political/religious factors, that perhaps would make a two state settlement improbable. The ideas of a bi-national and a unitary state are discussed following this, with many questions as to the actual nature of how each would be arranged, and how two people now well divided would react to a quick change to either of these states. The Israel/Palestine conflict is the kernel of cancerous radiation, unseen, but causing not only the ethnic cleansing and apartheid arrangements of Israel’s actions, but also being the underlying source of all the neo-imperialist actions of the U.S., the EU, and related allies throughout the Middle East. A Half Century of Occupation should be a part of any academics bookshelf. It is well grounded in international law, humanitarian law, and history. It is very well written, and while it is essentially an academic book, it should be accessible to those with some knowledge of the themes under discussion.